A guest lecture by Agustina Giraudy of American University. 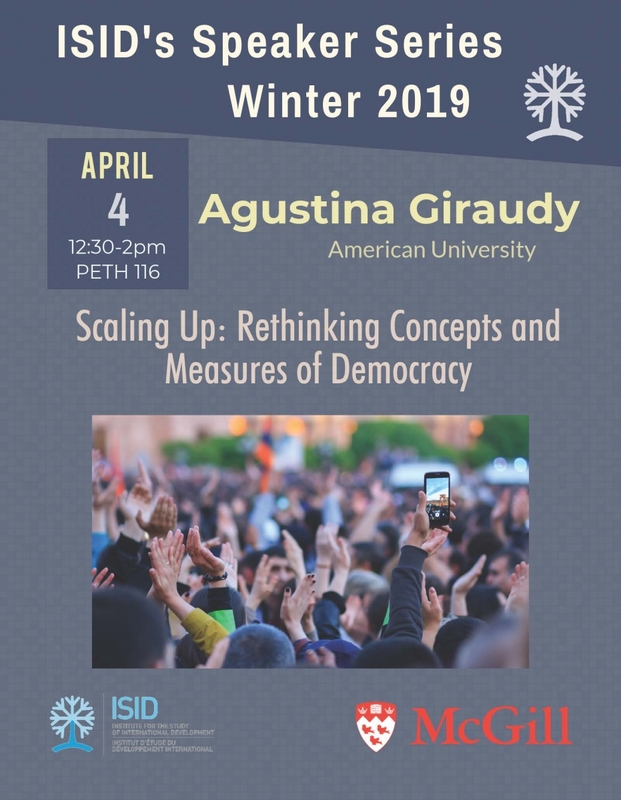 Bio: Agustina Giraudy is an Assistant Professor at the School of International Service at American University. Her research interests include, subnational democracy, subnational institutions, and subnational research in comparative politics. Professor Giraudy's book, Democrats and Autocrats (Oxford University Press, 2015), explores the multiple pathways towards subnational undemocratic regime continuity within democratized countries. A second, co-edited book with E. Moncada and R. Snyder, Inside Countries: Subnational Research in Comparative Politics (Cambridge University Press, 2019) assesses the theoretical and methodological contributions of subnational research to comparative politics. Prof. Giraudy's work has appeared or is forthcoming in the Journal of Politics, Journal of Politics in Latin America, Studies in Comparative International Development, Latin American Research Review, Journal of Democracy (en Español), Regional and Federal Studies , Revista de Ciencia Política (Chile), among others. Before joining AU, Professor Giraudy held a postdoctoral position at the Harvard Academy for International and Area Studies, taught at Universidad Torcuato Di Tella (Argentina) and Universidad de San Andrés (Argentina), and worked as a consultant for the Ford Foundation, the Inter-American Development Bank, and the World Bank.